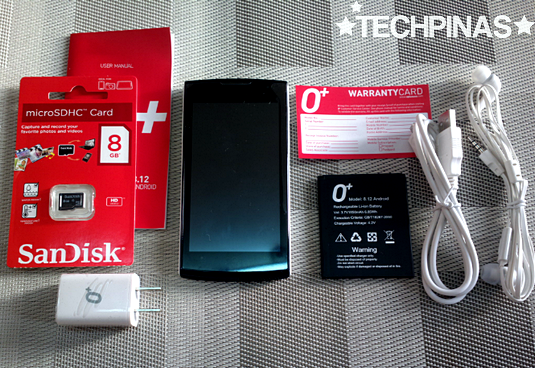 O+ 8.12 Review, Price, Complete Specifications, In the Flesh Photos, Unique Features, Verdict! 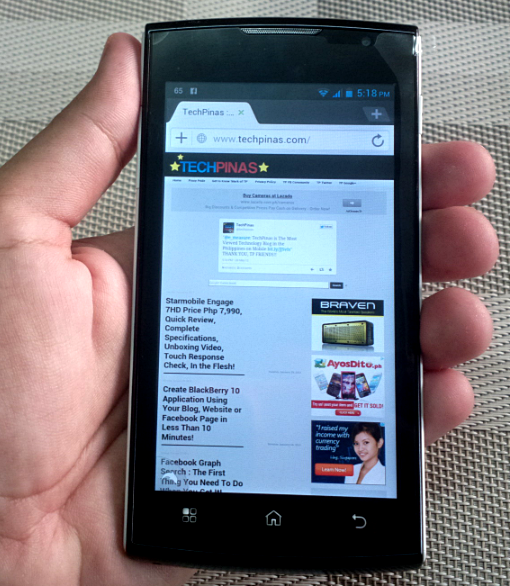 TP Friends, here's another affordable yet powerful handset that I got recently. O+ 8.12, which reached our shores December last year, is currently the flagship release of the American company in the Philippines. As such, it comes with the best technical specifications that you can get from any model in their current line-up of Dual SIM Dual Standby Android smartphones. For only Php 11,995, you can already own this device replete with 1 GHz Dual Core processor, 1 GB of RAM for efficient multitasking, an 8 MegaPixel autofocus camera with LED flash, an HD video recorder, a massive 4.5-inch qHD IPS display, and a rather hefty 1800 mAh Li-Ion battery pack. I've been using this handset for a couple of weeks now and I want to share with you the eight things I love about it. 1. Unbelievably solid construction - The first time I held this phone, I was instantly smitten by how solid it felt in my hand. Sure, the phone doesn't have a metal enclosure but it's very durable. No flex whatsoever. I've actually accidentally dropped my handset (to my horror; You all know how careful I am of my gadgets. I love all of them.) and to my relief, it didn't get a single dent. 2. Ultra-slim, High-end Design - Measuring only 10.9 millimeters at its thickest point, O+ 8.12 is one of the slimmest Android smartphones you can get in the market. It's very, very sleek. I also like that it effortlessly exudes this high-end air, which is noticeable even from afar. I tell you, you won't be shy to take this out of your pocket and to show it to your friends. 3. Large, High-resolution Display - There are other smartphones in the market with larger displays but few of them come in high-resolution. 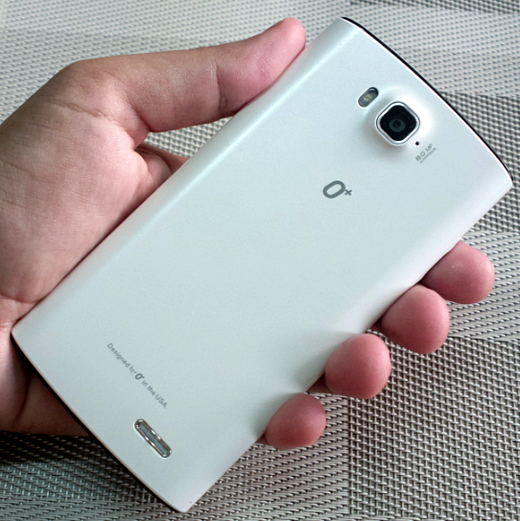 O+ 8.12 offers a combination of both with its massive 4.5-inch qHD IPS LCD delivering crisp details and brilliant colors. *Above the display, you'll find the ambient light sensor, which makes O+'s unique Air Shuffle feature possible. Air Shuffle allows you to take photos, play music tracks, and browse photos simply by waving your hand in front of the smartphone's screen. No need to touch the display or press any buttons! This is particularly useful when taking self-photos using the 8 MegaPixel main camera. 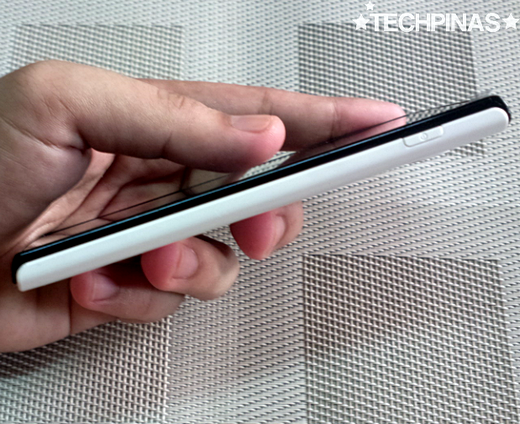 More about this stellar feature on TechPinas soon! 4. Stellar Innards - The 1 GHz Dual Core ARM Cortex-A9 based MediaTek MTK6577 processor paired with 1 GB of RAM delivers and fast and fluid user experience on the smartphone. I mean, O+ 8.12's Quadrant Standard scores sheet speaks for itself. I'm totally, 100% confident that my handset will run Android 4.1 Jelly Bean smoothly when it receives the firmware update from O+ later this year. 5. Scratch-Resistant Touchscreen - The durability of the handset's body is perfectly complemented by its ultra-tough scratch-resistant glass touchscreen. According to O+, this screen is strong enough to be used to crush a walnut or a pistachio nut. Hmm, let me try that out -- but not with my phone, of course. 7. Surprises in the box - O+ was generous enough to include a free 8 GB microSD card for expanding the phone's 2.5 GB user available internal storage as well as earphones with noise-cancelling silicon earbuds! Remember, this powerhouse handset only costs Php 11,995, so that's already a major bonus! If you're wondering: Yes, I have an unboxing video! I'll post that one soon as well. Stay tuned, TP Friends! 8. Decent Battery Life - While O+ 8.12 doesn't have the biggest battery pack of any Android phone currently available, its uptime, for me, is decent enough. I personally get around 8 to 10 hours of regular use (Facebook, Twitter, Temple Run 2, Dolphin Browser, texting, calling) from the handset and I think that's already cool. Of course, it depends on how you use the phone, if you don't use WiFi or mobile connection that much, I'm sure you'll get a far longer uptime from the device. So what's my verdict?! All things considered, I give it 9.8 out of 10 TP stars. I love this smartphone! I totally recommend it to all budget-conscious consumers who are looking for modestly priced device that won't let them down and that they won't be shy to flaunt. In terms of build, design, multimedia features, and technical specifications, I honestly think that O+ 8.12 is the phone to beat in its price echelon.